Plaster for the sheet gaps: Once centering is completed this activity need to be performed. 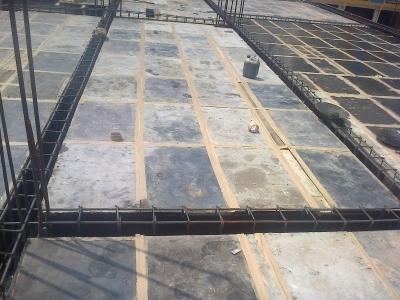 This will be done to avoid concrete mix leaks. 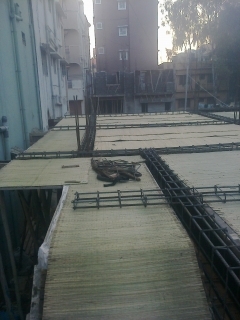 Now a days people are using mats on top of metal sheets. With this we have two advantages. No need of hocking at the time of centering removal. 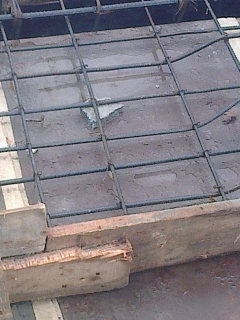 Spray water before pouring concrete on these mats so that gaps will get reduced. Remove these mats immediately after centering sheets are removed. it will be easier to remove when it is wet. Usually Inverter beams will come if you are going to construct a wall where there is no beam. So for example during ground floor molding time you should have first floor plan ready. Hooks in the roof will be helpful to hang caddles in hall and bedroom. This will be useful for the families who has infants/children. After molding no one should hold pillar rods. If some holds pillar rod and leaves, it will create few small vibations and these vibrations will leave small gaps in pillars. 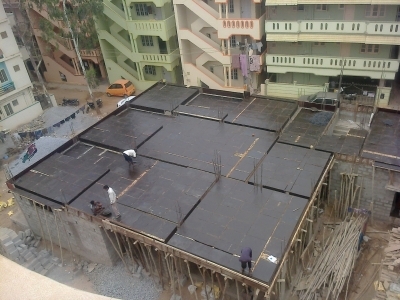 bring 100 bags of cement, ~ 700 cft of sand, ~700 cft of 20 mm gravel (20 MM jelly).